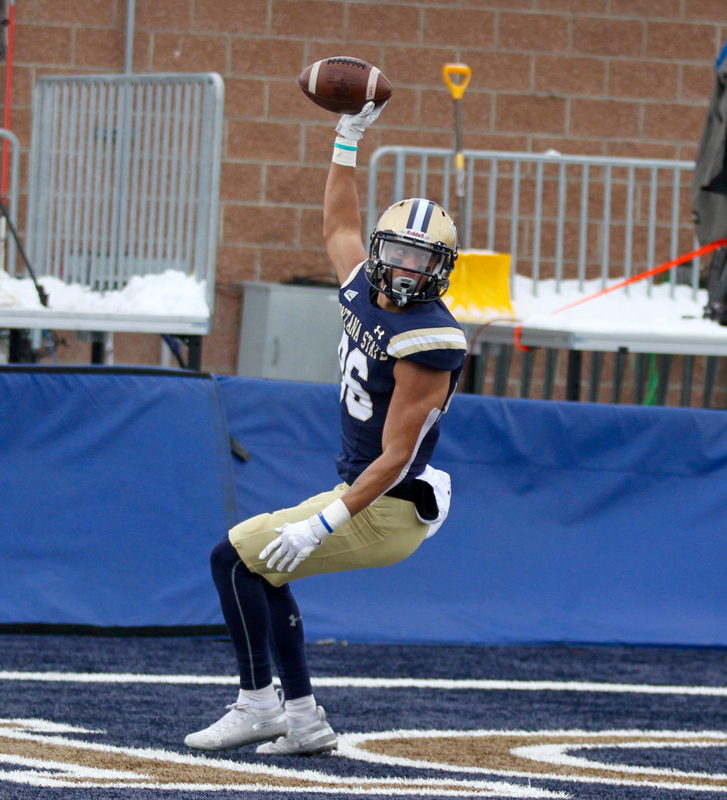 BOZEMAN — As the replay on the Bobcat Stadium scoreboard showed Travis Jonsen’s right foot land in the end-zone and his left foot knock over the pylon, Montana State’s entire offensive unit simultaneously signaled for a touchdown while squatting and dancing in synchronicity on the MSU sideline. When the officials ruled Jonsen’s 37-yard reception a touchdown, the home crowd erupted. 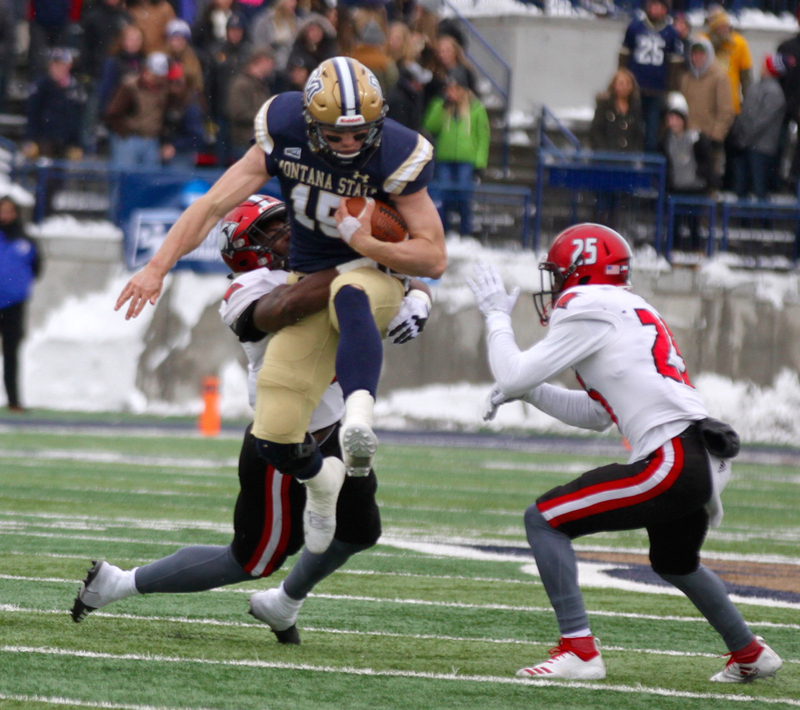 For the first time in half a dozen years at Montana State, a playoff victory was in reach. 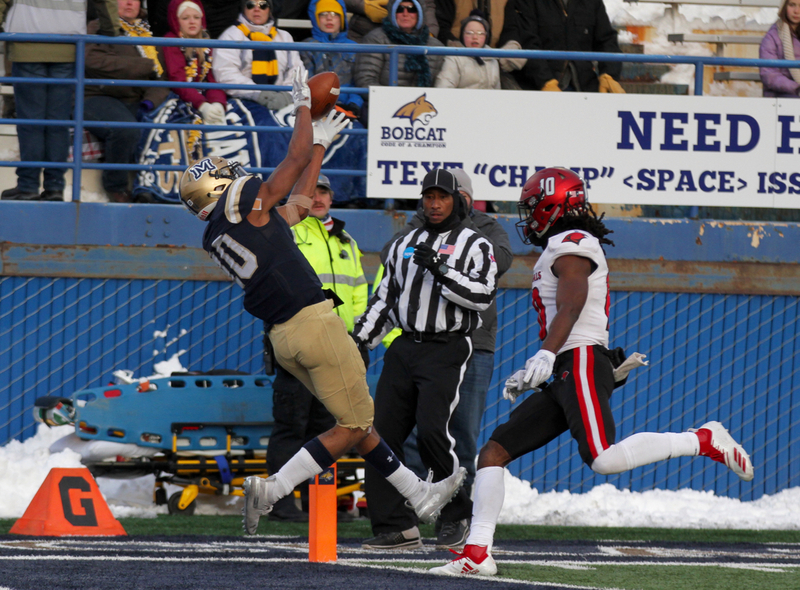 Jonsen’s touchdown catch, his second touchdown in the first four minutes of the fourth quarter, pushed a once-close game to a three-score margin for the host Bobcats. The pass pushed Troy Andersen over his career high for passing yards in a game this season. And the score seemed to push increasingly mercurial Incarnate Word over the edge. 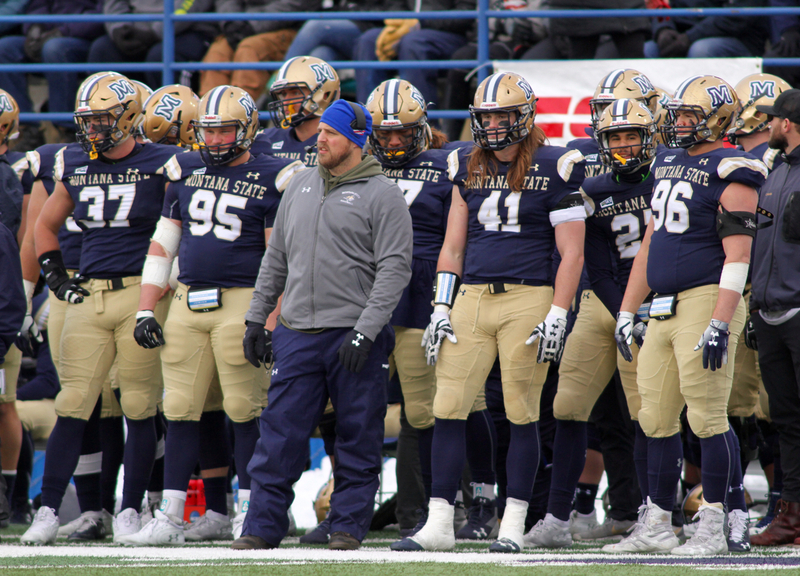 With head coach Eric Morris melting down on the visitor sidelines and his team in an increasingly growing hole, Montana State could feel the elusive postseason victory drawing closer. After Jonsen’s score put MSU up 35-14 with 10 minutes, 43 seconds left, UIW backup quarterback Sean Brophy — making his first start after starter and Southland Conference Freshman of the Year Jon Copeland suffered a season-ending knee injury last week — hit Kody Edwards for a 66-yard gain inside the Bobcat 10-yard line. But Jahque Alleyne chased Edwards down from behind, stripping the ball and giving possession back to the Bobcats. From there, the Bobcats continued to bludgeon the Cardinals with a deliberate, physical run game spearheaded by Andersen and true freshman Isaiah Ifanse that has been the Bobcats’ bread and butter the last two months. By the time the final buzzer sounded, Montana State had its first victory in the FCS playoffs since 2012. 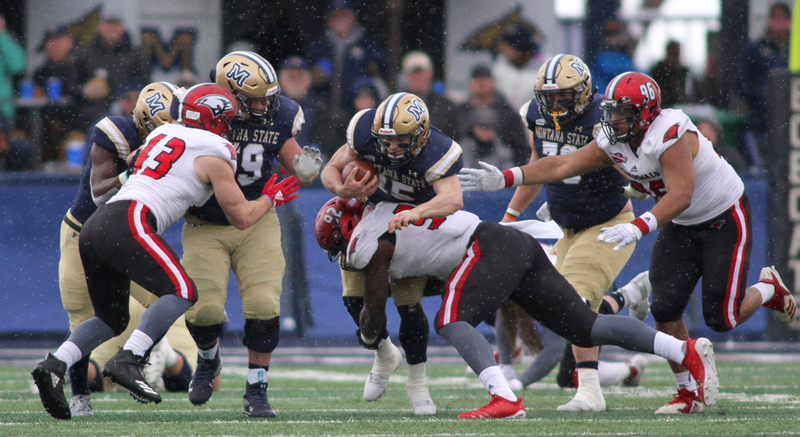 Behind a playoff single-game record 141 yards from Ifanse, the Bobcats rushed for 339 yards on 66 bruising carries en route to a 35-14 victory in front of 10,017 fans in the first round of the FCS Playoffs at Bobcat Stadium on Saturday afternoon. “The message at halftime was, ‘Fellas, keep pounding. Do what we do,” MSU third-year head coach Jeff Choate said after moving to 17-17 in his career at Montana State. “Sooner or later, those body blows turn into knockout shots and I think that’s exact what happened. 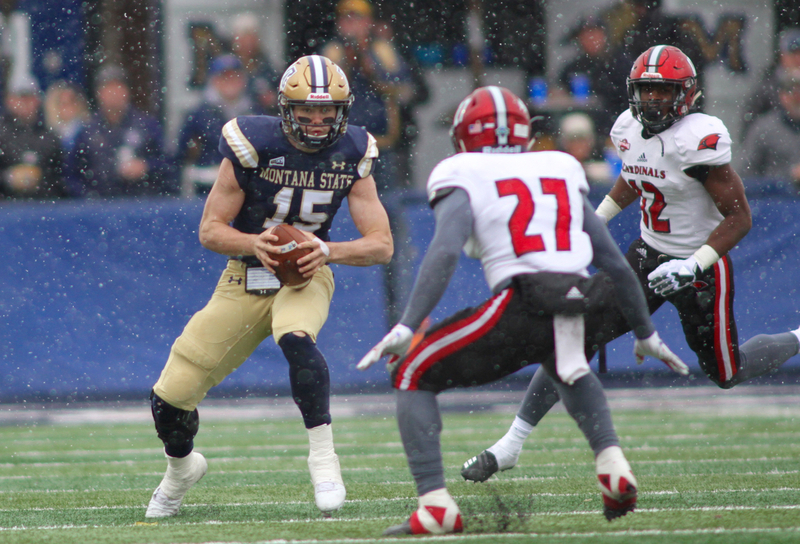 Montana State’s first postseason victory since defeating Stony Brook 16-10 in the second round of the 2012 FCS playoffs is MSU’s fourth straight win this season and the Bobcats’ eighth victory overall. Montana State moves on to face top-seeded North Dakota State, winners of six of the last seven FCS national titles. The Bobcats used a similar formula as they have all season on the way to an 8-4 mark and a berth in the Round of 16 in the post-season tournament. 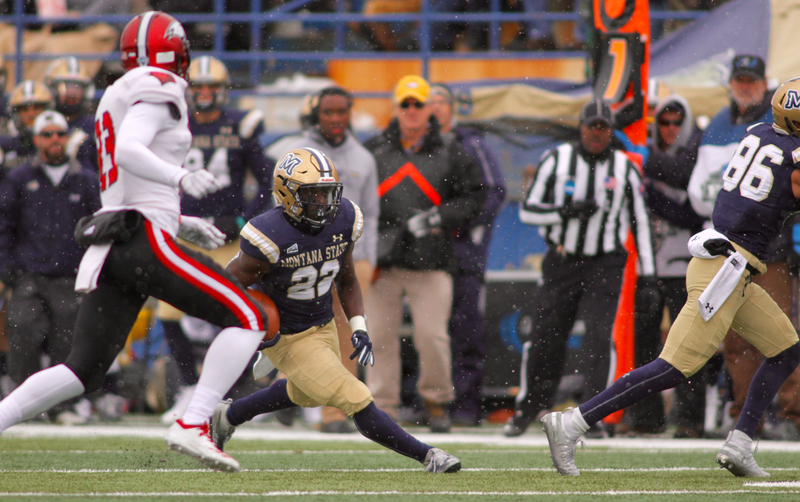 Montana State never wavered running the football on Saturday, instead going back to the well over and over again despite Incarnate Word stacking the box, flying to ball carriers and showing surprising physicality in the face of the winter elements that highlighted the freezing afternoon. 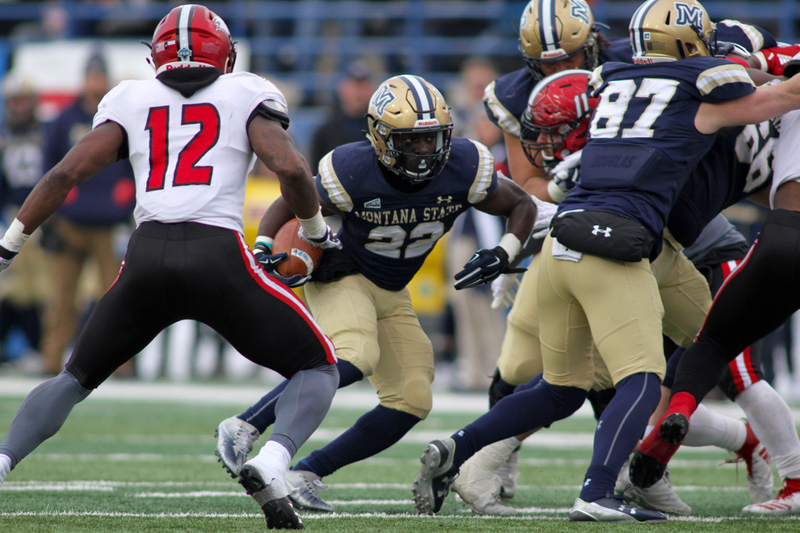 Montana State rushed for 128 yards in the fourth quarter, finishing with 339 yards behind Ifanse’s record afternoon. His 141 yards shattered the previous single-game playoff high of 115 shared by Tony Kostrba against New Hampshire in 1976 and Chad Newell in MSU’s last playoff game, a 47-40 loss to South Dakota State in 2014. Ifanse, the 2017 Washington Gatorade Player of the Year from Bellevue High, now has 1,034 rushing yards this season, shattering former quarterback Chris Murray’s freshman record of 860 yards set in 2016. Ifanse’s five 100-yard games are also an MSU record. “That’s a big-time deal for him to put his name in the books and I know that’s something our offensive line wanted for him,” Choate said. Andersen finished with 84 yards on 21 carries, just the second time he’s started at quarterback and been held under 100 yards on the ground this season. 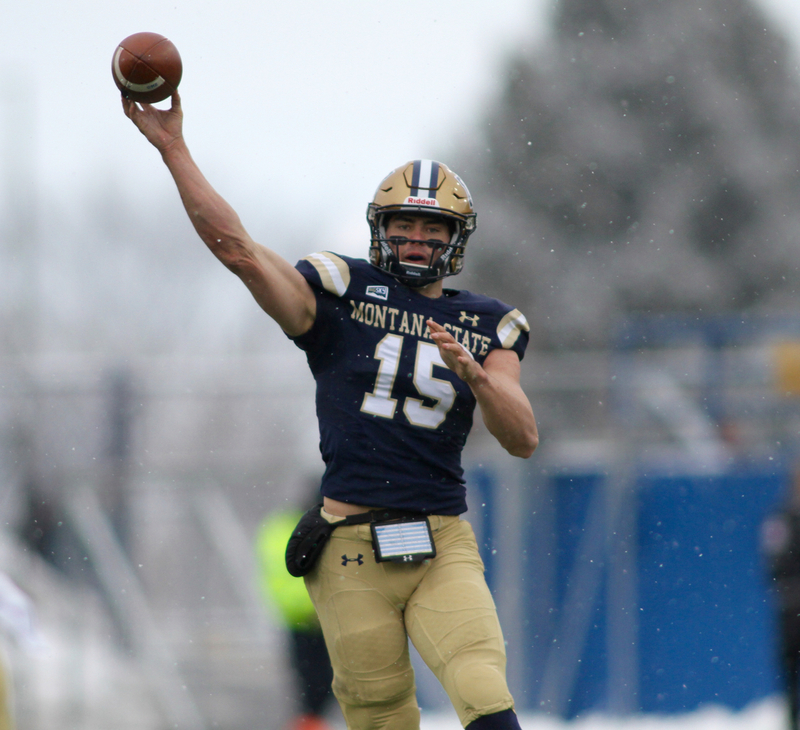 But he completed 12-of-19 passes for a season-high 164 yards, including a 39-yard bomb to set up a key touchdown late in the first half and the 37-yard touchdown throw to Jonsen to seal the seventh playoff win in MSU history. 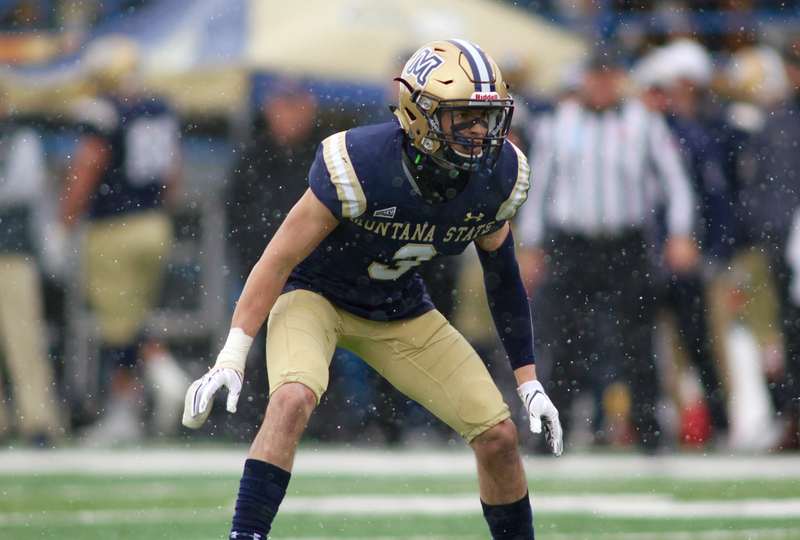 Montana State did not score a point on offense until Tristan Bailey hit a 35-yard field goal with three minutes left in the first half to give MSU a 12-7 lead. The first nine points came off a blocked punt by freshman linebacker Nolan Askelson that sophomore Lance McCutcheon returned 11 yards for a touchdown and a safety recorded by MSU senior linebacker Grant Collins when he forced an intentional grounding call in the South end-zone after pressuring Brophy. MSU closed the first half with a one-yard touchdown plunge by Andersen with 26 seconds until the break. The touchdown was the Dillon product’s 20th this season, tying the single-season record held by Don Hass since 1966. Andersen’s 39-yard heave to Jonsen and a 17-yard dart to Kevin Kassis helped set up the score and helped MSU take an 18-7 lead into intermission. 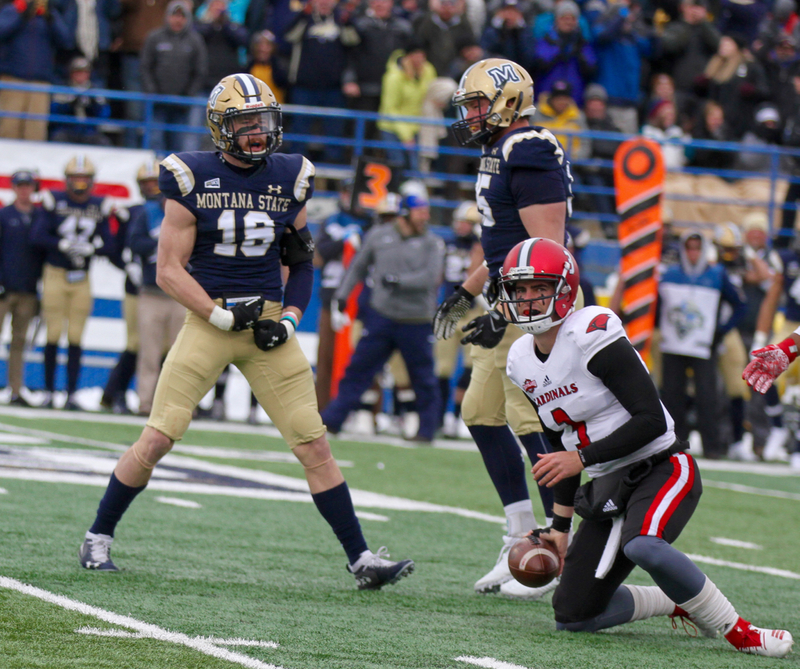 Montana State’s advantage could’ve been larger if not for a failed fake field goal on a 4th & 9 from the UIW 11 and a missed 44-yard field goal attempt by Bailey. Out of the break, Brophy led a seven-play, 66-yard scoring drive capped by a 33-yard touchdown to Kody Edwards that cut the Bobcat advantage to 18-14. The Cardinals ran just six more plays the rest of the third quarter and 18 more plays the rest of the game as Montana State continued to pound. The Bobcats answered the Edwards touchdown with a 13-play drive capped by a 19-yard Bailey field goal that ate up 6:10. After four runs by UIW tailback Ra’Quanne Dickens, a first-team All-Southland performer who rushed for more than 1,000 yards and 14 touchdowns during the regular season, the senior had to be carried off the field with what appeared to be an ankle injury that ended his day. MSU defensive linemen Tyrone Fa’anono and Chase Benson stuffed Ameer King, forcing a punt. The Cardinals would not get the ball back until a few minutes into the fourth quarter. Andersen engineered a 14-play, 93-yard drive that at first appeared to be capped with his record-setting touchdown. But an illegal hands to the face penalty on sophomore tight end Ryan Davis negated what would’ve been the Dillon native’s 21st touchdown this season, instead setting up Jonsen’s 19-yard scamper to push the advantage to 28-14. Two plays after Jonsen’s touchdown run, Konkol ripped the ball from Kam Williams’ hands and Ty Okada recovered. 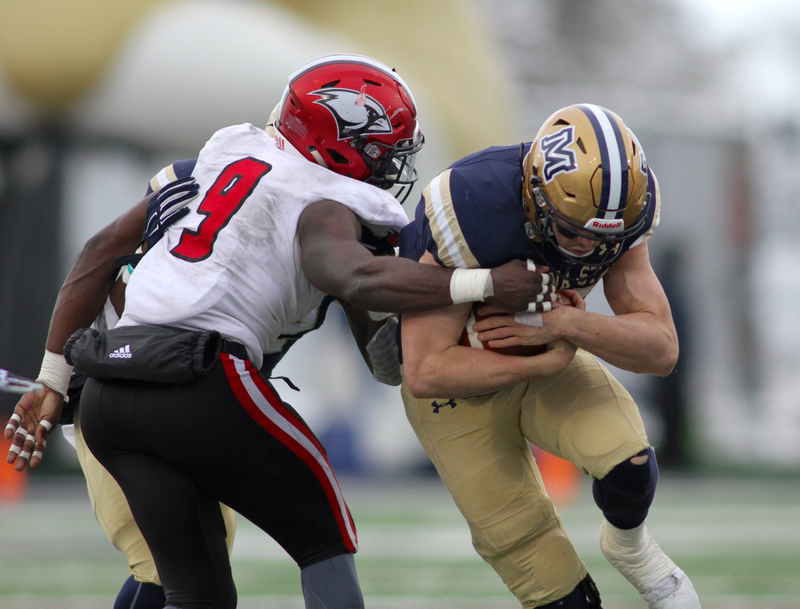 UIW was called for an unsportsmanlike conduct penalty, setting up Andersen to Jonsen for 37-yard touchdown that proved to be the game-sealing score. On the possession after Jonsen’s touchdown catch, Brophy hit Edwards for the long gain inside the MSU 10-yard line but Alleyne chased him down, stripped the ball from behind and Konkol recovered. UIW would be called for four more penalties in the final 10 minutes and a total of 13 overall. Those flags plus four turnovers were too much for the Cardinals to overcome. “I wish I could say it was because it was our first time here,” UIW first-year head coach Eric Morris said. “A bunch of them were undisciplined penalties. Montana State’s ability to possess the ball allowed Incarnate Word just 54 plays all afternoon. UIW managed 13 first downs. The eighth-ranked offense in the FCS in terms of total yards per game finished with 382 yards, more than 100 less than its season average. MSU held the ball for 41 minutes, 22 seconds. 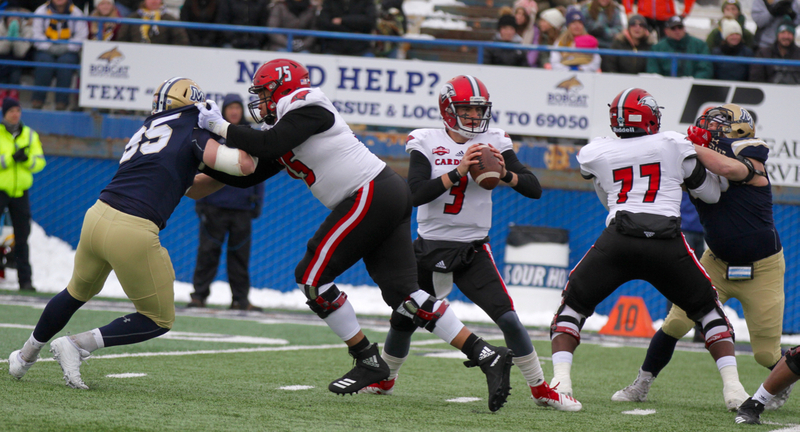 In just its 10th season playing football, including its sixth competing in the Football Championship Subdivision, UIW shared the Southland Conference title with Nicholls State, advancing to the 24-team postseason tournament for the first time in Morris’ first season at the helm. The loss ends UIW’s season with a 6-5 record. Incarnate Word’s Dec. 1 matchup against Iowa State has been cancelled. 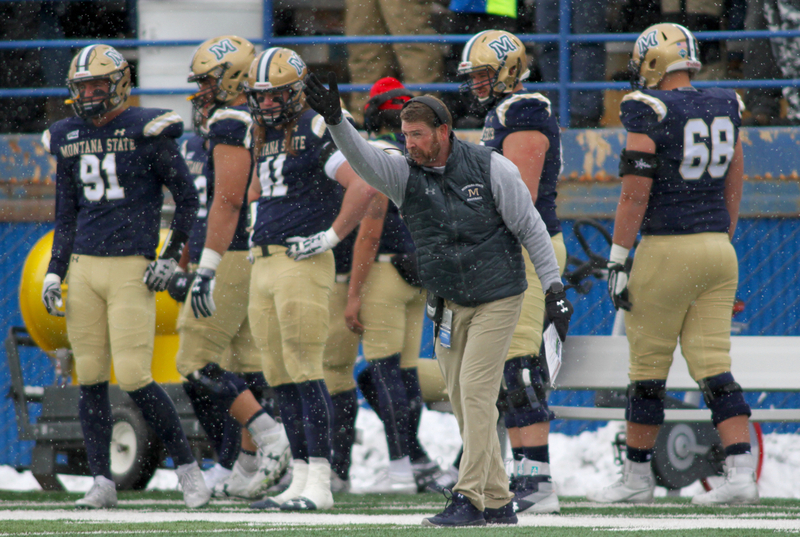 Following surrendering a 17-7 lead at Weber State in a 34-24 loss, Choate shook up his coaching staff, letting go passing game coordinator Bob Cole, demoting offensive coordinator Brian Armstrong and moving wide receivers coach Matt Miller to OC. That change has coincided with an offense that has averaged 306.6 yards per game on the ground, 432.2 yards of total offense per outing and averaged 33 points per contest. MSU is 4-1 during the span and on the first four-game winning streak of the Choate era. Now the Bobcats will see if they can carry the momentum against one of the great dynasties in the history of college football. Since losing in overtime of the quarterfinals of the 2010 playoffs to eventual national champion Eastern Washington, NDSU has won 108 of 116 games, racing to five straight national titles despite the departure of head coach Craig Bohl to Wyoming following the 2013 season. Chris Klieman took Bohl’s streak of three titles and pushed it to five with wins in 2014 and 2015. The Bison lost in the semifinals of the 2016 playoffs only to finish 14-1 with another FCS crown last season. Preparing for a juggernaut will come soon enough. Following the first playoff win of his college head coaching career, Choate chose enjoy the moment.